A solo trumpet played holiday songs as one vendor at the farmer’s market yelled, "Goat cheese! Free samples!" Another was nudging customers to buy his exotic mushrooms, and a young vendor was "forcing" me to try every kind of hummus he had on display. Pomegranates and persimmons marked the change of the seasons and the start of my ordinary Tuesday market experience. But an unexpected encounter illustrated for me how important access to healthy food and food assistance programs can be. I stood in line to purchase two bright red pomegranates when I noticed a young boy staring at my basket. He was about 8 years old and turned to his mom to ask if he could buy a pomegranate too. Utterly surprised, she let him pick one out. “Is this a good one?,” he asked. His mother, amused, assured him that his selection was excellent. The boy then set his eyes on a large bright orange fruit. He clearly had never seen something of its kind before. I decided to intervene. “That’s a persimmon,” I told him and pointed to the free samples. He eagerly grabbed a toothpick, picked a slice of persimmon and devoured it. He thought for a second, and then looked up at me wide-eyed and said, "Wow, that was really good." I witnessed the moment of joy as he experienced a persimmon for the first time. That’s when I noticed the WIC (Women, Infants and Children) vouchers in the mother's hand. She tore off the appropriate amount of vouchers for the selection of fruit she’d bring home to her five children and paid for the rest with her EBT (Electronic Benefit Transfer) card. This brought back memories from my own childhood. I was transported to that moment of embarrassment as I watched my own mother pay for our groceries with Food Stamps, hoping no one would see. I wasn't much older than the young boy in front of me. I also remembered how excited I would get when my mom would let me buy a special treat (which was more likely circus-box animal crackers and not a pomegranate). I felt connected to the family standing in front of me, because not long ago, that was my reality too. As the vendor bagged the produce, I asked the boy how he liked coming to the market with his mom. "This is our first time here," he said. Their first time at the market I loved so much. You would have thought he was a kid in a candy store, but instead it was a market with fresh fruit and vegetables. When I was a kid, our food options were limited to the big box grocery stores that accepted Food Stamps, and in many neighborhoods in our country, this is still the case. Historically, fresh markets have simply not been a choice for many families. However, recent WIC and EBT reforms have made it possible for more families to access fresh local markets. In 1992, WIC, led the way in by implementing the Farmers Market Nutrition Program (FMNP), which gives WIC beneficiaries the opportunity to use vouchers to pay for farmer's market produce. This program was expanded in 2009 with the addition of Fruit and Vegetable checks to the WIC food package. California is one of only 18 states that have authorized farmers to accept WIC Cash Value Vouchers (PDF), and it operates the largest FMNP in the nation with over 430 certified markets serving nearly 150,000 families. In 2010, low-income seniors became eligible to receive vouchers through SFNP (Seniors Farmers Market Nutrition Program). Further, in 2012, the USDA made it possible for states to expand funding for wireless technology in farmer's markets participating in the Supplementary Nutrition Assistance Program (SNAP). This has been a win-win for local farmers and families. Access to wireless technology enables local farmers to take payments via EBT cards. These cards replaced the paper Foodstamp program and work like debit cards except for being subject to restriction on where they can be used and what can be purchased. According to the USDA, there are currently over 1,500 farmer's markets using the technology and since it was first introduced in 2008, SNAP expenditures at farmer's markets have risen 400 percent. Reforms like these will soon make our nation's over 7,100 farmer's markets accessible to those using SNAP benefits. As I looked down at my ten-dollar bill, I realized I didn't have to worry about whether or not my money would be accepted where I chose to buy food. I don't know why the family I met needed financial assistance or what their daily life is like – it is impossible to know from the outside. Some people make insensitive generalizations about the type of people that utilize our assistance programs, and are often shocked to learn that I was a welfare baby. "Well, you're different," they say in an assuring tone. But, I wasn't. My family needed help just as much as any other family. There are thousands of moms just like mine, who want their kids to grow into strong healthy adults. SNAP helped me graduate from high school -- making college, the Peace Corps, and a graduate degree from the University of Southern California possible. Without these programs, that little boy might never have tasted a persimmon. The mom finished paying, and I overheard her exclaim, "The fruit here tastes better!" This is something that those of us who shop regularly at the market know very well. I often feel that due to our commercialized food culture, people are forgetting what real food tastes like. Unfortunately, we live in a country where eating real food is no longer a right. It is a privilege reserved for those with the means to shop where fresh produce is sold. Every family should be able to choose healthy options. 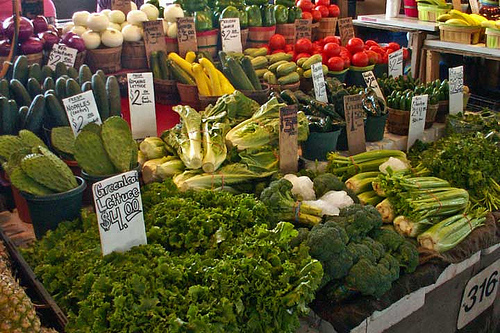 Every mom should get to take her kids to a farmer's market to experience the diversity of food grown locally. Every little boy should get to try a persimmon. This blog post was adapted from Chelsea's personal blog. Images by Chelsea Willett. The Built Environment: Designed for Disease or Designed for Health? Thanks Chelsea! Good prices and Great view, the thing is, is that this farmer’s market is pretty tiny. It still has a lot of good produce, Goat cheese, flowers and knick knacks, it's just more limited. I like it because you can buy fresh fruits and food and fresh markets have simply not been a choice for many families. Once again Thanks for Sharing!